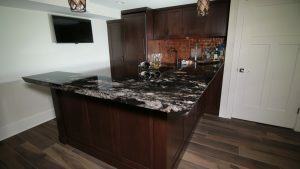 Marble countertops are a very popular choice in kitchen remodels. They are elegant and sophisticated, really enhancing the look of any kitchen. However, they are also quite sensitive. Marble is softer and more porous than other types of stone, leaving it vulnerable to etching and staining. If not treated carefully, it can suffer damage that is hard to fix. Luckily, there are ways to keep marble looking beautiful and like new. Enjoy these tips. When preparing food and drink, always place a barrier between your kitchen tools and the counter. Barriers can include cutting boards, coasters, or trivets. Using these items will lower your chances of accidentally scratching the marble with a knife or scarring it with a burn mark. Cleaning marble countertops is not difficult, but it’s important to clean them the right way. It’s best to use warm water and a gentle cleanser such as dishwashing liquid. Avoid products with lemon, ammonia, vinegar, or any kind of acid. These can cause abrasions or dulling of the surface. Be sure to go over the counter with a soft, dry cloth after cleaning. There are also cleansers made specifically for stone surfaces. If you’re not sure which one you should purchase, consult your professional installers. Everyone knows that when is comes to your health, prevention is the best medicine. The same is true for your marble countertops. A professionally applied sealant can help protect against damage caused by normal wear and tear. Your marble will likely already be sealed when it is installed, but it’s important to apply new sealant on a regular basis. A professional installation company can advise you on how often you should reapply and even do the reapplication for you. Marble countertops can elevate the look of your kitchen for years, as long as you know how to maintain them. Following just a few simple rules will help keep your kitchen looking beautiful. If you have any questions about your countertops, don’t hesitate to consult a professional.